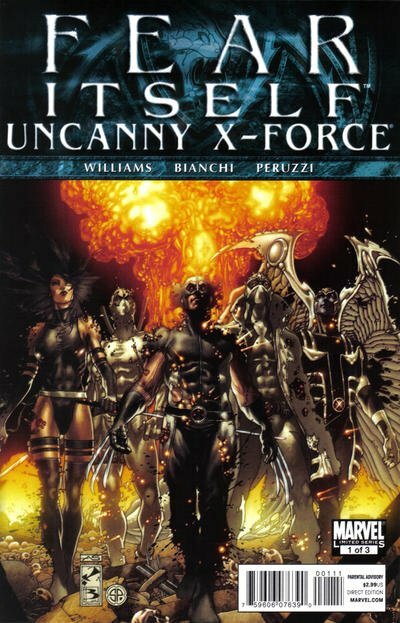 Click Here To See Fear Itself: Uncanny X-Force #1 Comic Book! Check out this awesome Simon Bianchi INK WASH semi-splash page, featuring AWESOME images of Archangel; Deadpool; Fantomex; Psylocke and a GREAT Wolverine image! In this great story, X-Force begins investigating new acts of anti-mutant terrorism brought on by the global chaos and panic of the Asgardian Serpent God of Fear. The covert team's search leads them to the Purifiers, a paramilitary mutant hating religion. Art is signed at the bottom by Bianchi.